The Marinette Guest House was conceived as a practical work studio which would double as a 2-bed room guest house. The main house sit on a nearly 34,000 sf hillside lot. The main house is on the flat part of the site. Part of the sloped section of lot seemed a perfect spot for the long narrow bar of the guest house. 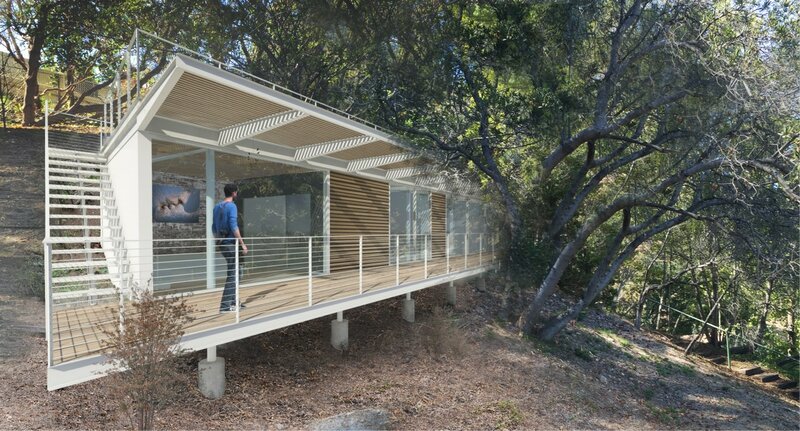 The 16 feet wide by almost 85 feet long single story structure takes full advantage of the best views that the site offers with almost a clear transparent side with sliding glass windows which double as entry and exits off of an overhanging balcony. The structure is tucked away in the hillside with a CMU retaining wall on the back side and a steel structure with wood joists completing its profile. Its a minimalist pragmatic approach which is consistently seen in many of the firm’s works.